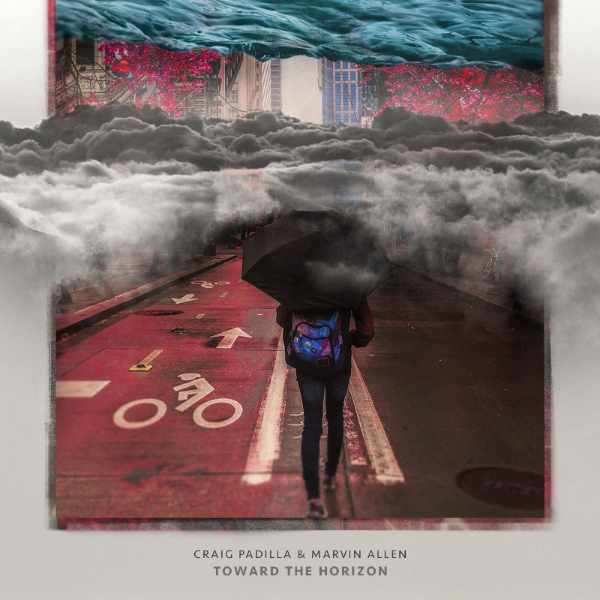 Spotted Peccary Music announces the release of Toward the Horizon, an album by internationally-celebrated and award-winning electronic music artist Craig Padilla and multi-instrumentalist, singer-songwriter, performer, and music educator Marvin Allen. Working together for the first time, these two skilled musicians have crafted a masterful free-flowing dreamscape that moves through a myriad of moods, revealing the many colors of an ever-changing sonic skyline. Melodic and rhythmic, surreal and drifting, the resulting music is a timeless adventure through illuminating guitar tonalities and majestic synthesizer vistas. Visit Spotted Peccary for more listening and purchase options (https://spottedpeccary.com/shop/toward-the-horizon/). Toward The Horizon is a recording project that began as a minor musical experiment and quickly blossomed into an alluring album that perfectly synthesizes the talents of two long-time friends who are finally collaborating for the first time. Padilla explains, "I've known Marvin since 1990 and I've always wanted to make music with him, but we've been traveling our own paths since then and never had a proper chance to collaborate until now. We began by riding the waves of inspiration and following our creativity to see where it would lead us." Electronic, ambient and rock music fans will thoroughly appreciate the resulting explosive melodies, classic Berlin school sequencing, and haunting ambient soundscapes. Allen uses Strymon Effects on his guitar, and all of the synthesizer parts on "Distant Waves" were created using only a modular synthesizer that was designed by legendary synth builder George Mattson. Padilla muses on the recording process, "On Hidden Marvin played a rippin' guitar solo, and when he finished he said �Reverse that, throw some reverb and any other magic on it and see how it sounds.'" The process clearly worked. Toward The Horizon is spacemusic in every sense. Hypnotic, captivating, dreamy, and vivid, the music drifts from electronic soundscapes to atmospheric textures, at times swirling and spinning through dazzling sequences and epic soaring refrains. The song "Tidal Disruption" suggests strange, beautiful mountains touching silver seas, while "Liquid Heaven" could be the essential exploration of those same mysterious empyrean waters. One's imagination is inspired to wander. With more than 40 releases over the course of his prolific career, Padilla has become a driving force in the electronic music scene. His music is regularly heard on XM Satellite Radio and radio stations throughout the US, including the celebrated radio programs "Echoes" and "Hearts of Space." This is Allen's first foray into the world of ambient electronic music; he is an established Northern California based multi-instrumentalist, singer-songwriter, performer, and music educator. Toward The Horizon releases February 22, 2019 on Spotted Peccary Music in both physical and digital formats, as well as 24-bit Audiophile format. For artist interviews, reviewer copies, and other media requests, please contact Beth Hilton at The B Company, mobile: 310-560-8390, or thebcompanypr@gmail.com. Portland, Oregon-based Spotted Peccary Music is North America's finest independent record label with a focus on deep, vast and introspective soundscapes. For over three decades, the artists of Spotted Peccary has been on a mission to develop, produce, publish and release ultra-high-quality, deep-listening experiences that engage the listener and exceed expectations. Every release is carefully prepared in a variety of high-quality formats from MP3 to high-res studio masters. Explore more than 160 titles and 45 artists at www.SpottedPeccary.com and www.AmbientElectronic.com.